While a consistent meditative practice teaches the value of hardihood and patient amidst physical and mental struggle, it is necessary to have the proper equipment to make yourself as comfortable as possible. Having less to worry about frees the mind to concentrate on attaining relaxation and bliss. Physical comfort usually precedes mental stability and unlike the yogis of old you can choose not to sit on rough floor surfaces to prove and assert a certain sense of discipline within yourself. The Zafu originated in China where it found popular usage as a cushion support for meditative practice and found its way to the Zen Buddhists of Japan. Cattail and reedmace were stuffed into the inner core of the fabric, as these were the soft materials available along the mountains where shrines and temples were located. At present, the Zafu is even more popular among novice and seasoned practitioners of Zen and other schools of meditative thought. 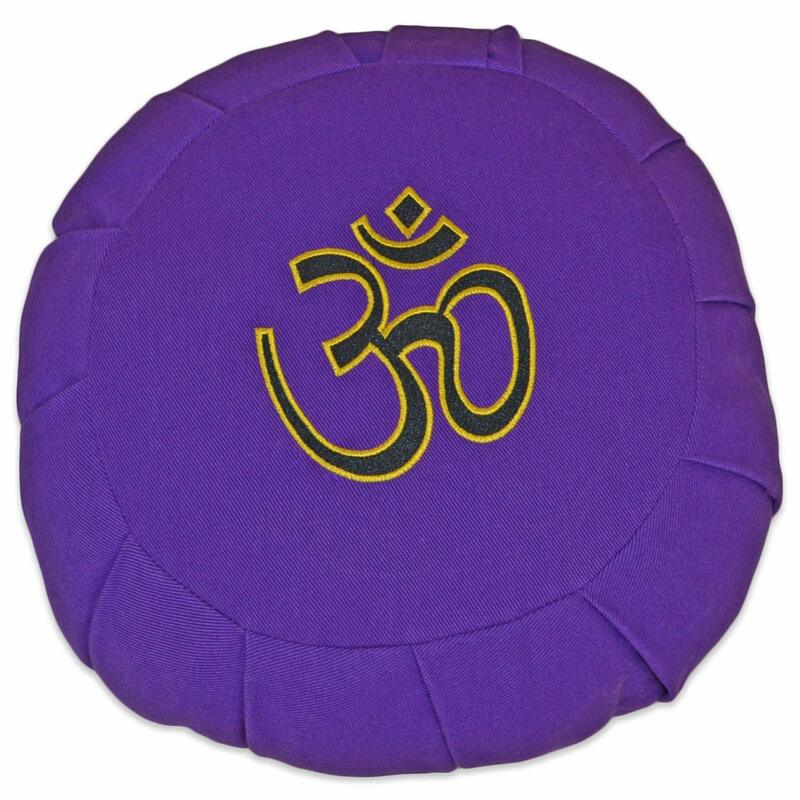 The YogaAccessories Round Cotton Zafu Meditation Cushion comes in the traditional round shape utilized by the Zen Buddhist practitioners of old, but built with far more durable materials. The fabric is filled with 100% natural cotton so every subtle movement and sitting position is cushioned in the most comfortable manner, allowing you to focus on achieving the meditative state you desire. A sturdy handle is fixed on one side for handling located along the heavy cotton twill cover. The size zipper opens easily and allows you to add, remove or replace the cotton inside. 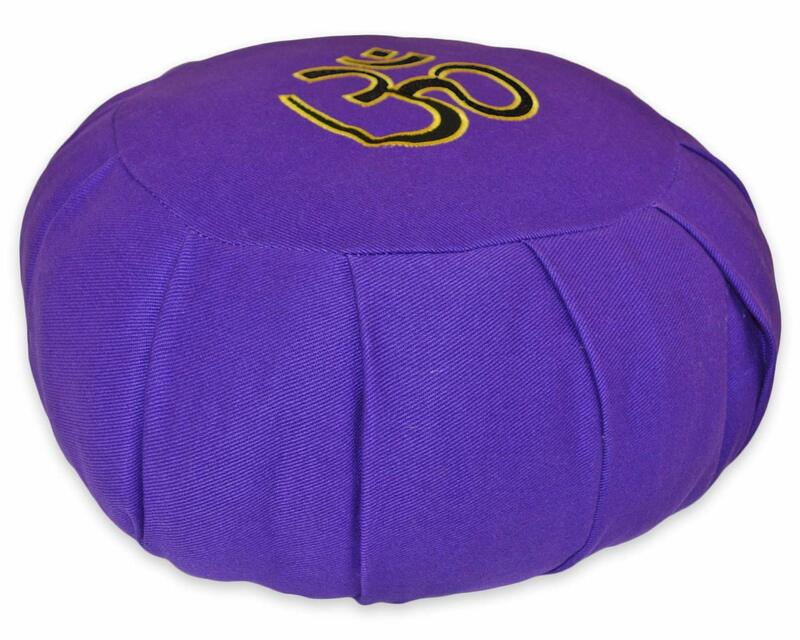 The cushion measures 15” in diameter and is 6” high when placed evenly on the ground. Enables you to raise your hips for cross-legged meditative positions. Contains 100% natural cotton for lasting comfort. Sturdy handle fixed along heavy cotton twill cover. Size zipper opens for you to add, remove or replace cotton. Measures 15” in diameter and 6” high. Add or reduced kapok and cotton for desired firmness:While the cushion is initially packed with all-natural cotton, you can add more soft materials inside such as kapok or extra cotton to achieve the firmness that effectively holds your particular postures and body type comfortably. Crescent shaped cushion also available: TheZafu comes in the traditional round shape, but a crescent-shaped cushion is also available for those who want to sustain cross-legged positions with inner thigh support. Various color patterns and designs are available:Whether you choose from plain colors to suit a more straightforward focus or those with floral and tapestry designs, you can match your Zafu’s look to your particular character and meditative style. Use only mild detergent when cleaning:the cover may be hand or machine washed, but only with cold water and a mild detergent. If spun on a washing machine, choose the gentle cycle setting. The core of the cushion may be spot cleaned only with mild detergent. Pay the proper respect to the Zafu before each session, if you can:Zen practitioners traditionally a gassho bow to the Zafuas a form of ceremony and respect, enabling them to begin with the proper frame of mind to enter meditative practice. Meditation should be more than a de-stressing session, but rather should be the center of a holistic approach to towards tranquility. The Zafu then becomes more than just an accessory as it takes an active role as the seat and center of your energy during meditation. A Zafu cushion derives its purpose and practices from centuries of Zen practice spanning generations. You can choose between the traditional round or crescent-shaped cushion for hip support and cross-legged positions so as to suit your particular meditative style. The inner padding is composed of 100% natural cotton for comfort, and a zipper allows you to add, remove or replace soft materials within and customize its firmness. A sturdy handle is fixed along a heavy cotton twill cover, allowing for one-handed lifting and ease of transport. The Zafu cushion measures 15” in diameter and is 6” high when set evenly on the ground.